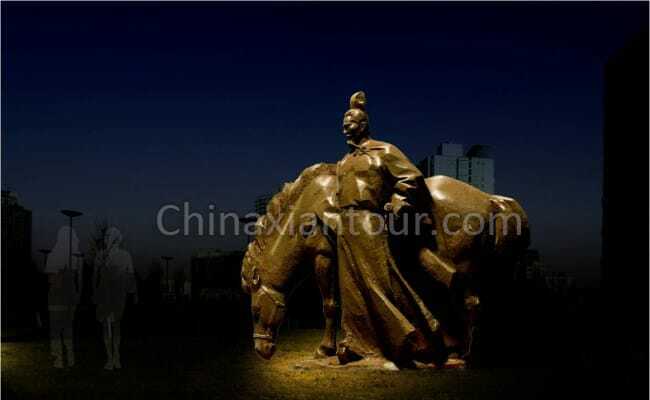 When talking about Silk Road famous Silk Road travelers, most people may think of Zhang Qian, the best known diplomat of the West Han Dynasty (202BC-8AD). But Banchao – a strategist & diplomat from East Han Dynasty (25AD-220AD) also worth people’s memory. People looking for a Silk Road China trip are not only for the grand nature views of those mysterious land but also for tracing the ever great story hidden back of the people like Ban chao. Banzhao, male, born in 32AD and passed away in 102AD. His hometown is today’s Xianyang which is close to Xian. His father Ban Biao, elder brother Ban Gu, and little sister Ban Zhao are well known historians. In his early years Ban Chao serves in government as a clerk. While when he learns about the tough situation of Xiyu (today’s Xinjiang and central Asia area), he decides to quit his job in government and join in the troop mastered by Dou Gu to fight against Huns. A few years later he was sent to Xiyu to recapture the lost dependent countries and govern the vast area. During his term of office in Xiyu, he recaptured 50+ dependent countries. The small countries in the vast Xiyu area are governed by Han government again. That remarkably reduce the wars among the small countries because they obey the Han government’s rules. The peace offers better life for peoples in Xiyu and makes it safer to travel through these countries. Just because of that, Western merchants dare to travel through Xiyu to East, and the specialty of East can be delivered to West. Among the specialties the best known ones are silk, tea, and porcelain. Porcelain has another name – china. And today’s country name China is from the nation’s specialty china. The trade route stretches through Xiyu is called Silk Road. That’s the well-kown worldwide Silk Road ancient China and advocated as a great project for development by China in the whole world: One Belt and One Road. In 100AD, Ban Chao submits his request to return hometown in his later years. In 102AD, he travels back to Luoyang, capital of East Han Dynasty. He was awarded by East Han Government with high dignity. Several months later, Banchao passed away and was buried on Mangshan Hill in Luoyang.